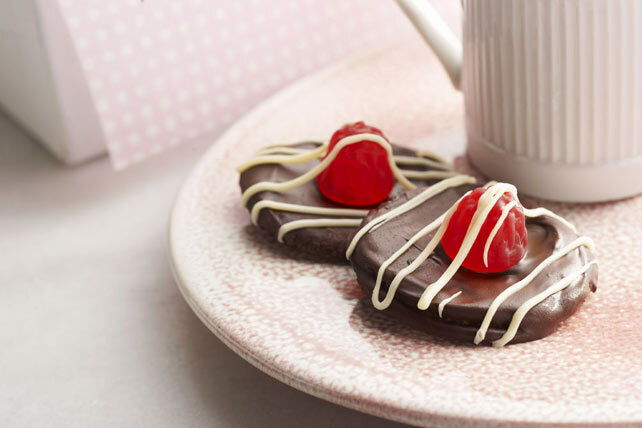 Make these simple Valentine's Chocolate-Covered Crackers for a loved one. Chocolate-covered crackers are topped with raspberry-shaped gummy candies. Microwave white chocolate in microwaveable bowl on HIGH 1 min. or until melted, stirring after 30 sec. Drizzle over crackers. Refrigerate 15 min. or until firm. These treats are perfect to share on a special occasion. Prepare using other shapes of gummy candies. If the chocolate coating on the crackers becomes firm before you are ready to top the crackers with the candies, add a dab of leftover melted chocolate to the bottom of each candy before placing on cracker to secure it to the cracker.